ACLS Advanced Cardiac Life Support provider and instructor classes. PALS Pediatric Advanced Life Support provider and instructor classes. BLS Basic Life Support provider and instructor classes. NRP Neonatal Resuscitation Program of the American Academy of Pediatrics. Provider certification. ACLS EP Advanced Cardiac Life Support for Experienced Providers, both provider and instructor classes. PHTLS Prehospital Trauma Life Support provider and instructor classes of the NAEMT. AMLS Advanced Medical Life Support provider and instructor classes of the NAEMT. We have all AHA Classes available on the NIGHT SHIFT TOO! Classes start at 7 PM. 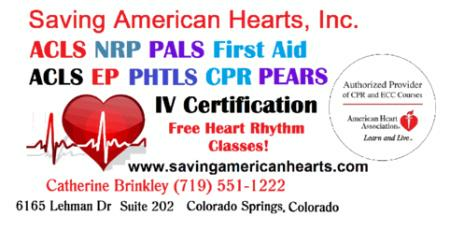 All AHA Classes get SAME DAY PROVIDER Card, classroom courses for ACLS and PALS get FREE BLS INCLUDED and all courses (except the skills sessions) get the most current provider manual included in the cost of the course. Welcome to our American Heart Association Certification Classes! We have Skills Sessions available for all classes. Our class minimum is ONE! We will provide one on one classes just for you, at no extra charge. We have multiple ways for you to learn that are specifically tailored just for YOUR NEEDS. We use videos, color association, pictures, and lots of hands on practice so that you are confident and comfortable. We provide tons of candy, coffee, snacks, popcorn, hot chocolate and bottled water. We want you to feel at home! You can take your written test with crayons too! Come have FUN with us! Our classes in a fun exciting atmosphere! Class doesn't have to be hard and miserable. You don't have to dread coming to class, and you don't have to feel stupid asking a question, or be humiliated! You really can have an amazing time, and you'll be surprised at how much more you will learn and how much fun you had! Our classes are taught in a FUN STRESS FREE ENVIRONMENT! Do you need a personalized 1:1 class where you can ask any question you want in privacy? We can help! We do one on one classes no extra charge! Our class minimum is one! Stop stressing over the ACLS or PALS Megacode ! Come learn with us and have fun! You'll master all the skills you need to successfully run an ACLS or PALS megacode in a friendly, relaxed, stress free FUN classroom environment! We have slumber party classes too! You are required to attend certain classes in your pajamas and bring a pillow and sleeping bag. We'll be laying on the floor with the lights out eating popcorn and drinking starbucks and hot chocolate while we watch the AHA movies on the ceiling! We always bring candy to class and if you can eat ALL OF IT, before the end of class, YOUR CLASS IS FREE! I've tried, gotten a tummy ache, and just can't do it! LOL! I also let you take your written test with crayons! Yes, crayons! Don't worry ! You will Master all the skills to successfully run a code as a team leader, and be 100% confident! Don't hesitate to call me, text or email any questions you have. Don't be afraid to ask a question. All of my courses will leave you feeling like "This was a piece of cake! I wish I had done this sooner! I learned a lot, I had fun and I'm really glad I took this course. I can't believe I actually enjoyed it!" We take great pride in our Stress Free approach to training. We teach in a manner that is conducive to learning in a non-threatening atmosphere, which promotes better understanding of the material. Please visit our website to see all the classes available! We have specials, and a real time calendar that frequently changes because we change class dates to match YOUR schedule! Amenities: Tons of parking FREE CPR Pocket mask for you to keep! Fun relaxed atmosphere We provide coffee, bottled water, candy and chocolate, snacks, popcorn, and hot chocolate for all our classes Our class minimum is ONE person!